All of the cold weather and extreme polar vortexes around the country may have most people hunkering down indoors, but ice fisherman are thriving, especially in the Great Lakes. This year has produced exceptional ice on many lakes that fisherman may not normally have the chance to explore, including the Great Lakes. 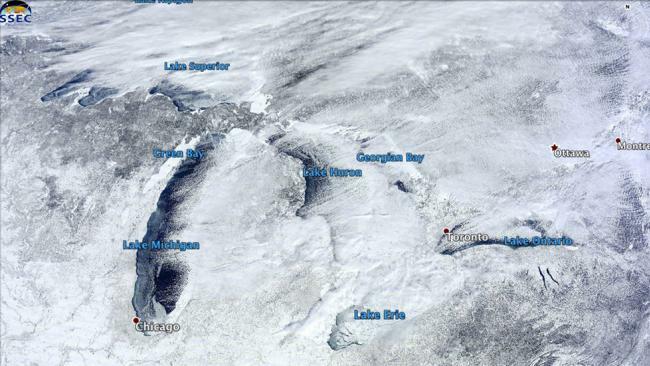 Three quarters (78.7%) of the Great Lakes are frozen this year, the highest percentage since 1996. The past four years have only produced about 40% of ice on the Great Lakes and the average over the last four decades is 51% ice coverage. The coldest Great Lake, Lake Superior has frozen 92% of it’s surface water, which has led to the opening of the Sea Caves along the shores of Northern Wisconsin. Lake Erie is 95% covered by ice, Lake Huron has 88% of it’s surface covered, Michigan is 53% and the deep waters of Lake Huron are at 29%. It doesn’t look like the cold is going anywhere anytime soon in the Upper Midwest, so there should be plenty of good ice out on the lakes. Walleye fishing on Lake Erie has been exceptional and everyone loves the big jumbo perch on Michigan this time of year. Let us know what you’ve been catching ice fishing and good luck out on the water.